Chlorastrolite pebbles collected in 1960; photo © Roger Weller / Central Michigan University (all rights reserved; used by permission). 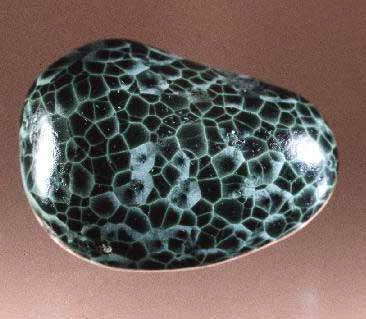 Chlorastrolite (a variety of the mineral pumpellyite) is a bluish-green stone with a pattern of slender, star-like crystals which results in a "turtle back" pattern. Some chlorastrolite includes other minerals, which produce additional colors. 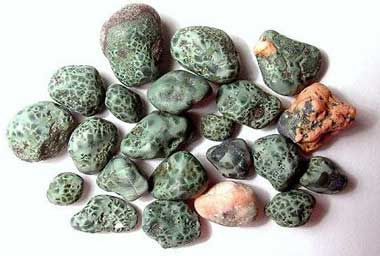 Isle Royale greenstone (sometimes called "green starstone" or "turtleback" in Michigan) is usually found as bean-sized, rounded beach pebbles (collecting chlorastrolite from Isle Royale National Park is now prohibited). Polished stones are used for stickpins, rings, earrings, cuff links, pendants, and sometimes incorporated into inlays and mosaics. Polished Isle Royale greenstone (chlorastrolite); photo © John Jaszczak: The Mineral Museum of Michigan - A. E. Seaman Mineral Museum (all rights reserved; used by permission).